We supply the only Product Recovery System that has EHEDG approval., and one of the only two that have 3A approval. Our systems are the most hygienic on the market. The Premisphere Product Recovery System technology offers a full range of systems that can be tailored to suit any process or budget. It features a totally in line design with no off line cavities or external to internal moving parts. The Premisphere systems uses magnets to control the launch and retention of the spherical pig. The use of a sphere ensures the highest standards of cleanliness, provides a longer lifespan of the pig and is fully cleanable in place (CIP). Our team of engineers have unparalled experience in producing the right control of pipeline pigs and spheres and experience has shown that our skills and judgement will give you a reliable and cost effective systems that will pay for itself in a very short time. 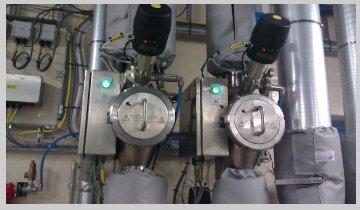 Premisphere (the three different types) -We design and manufacture the Premisphere fully hygienic pipeline pigging (product recovery) system, still the only system on the market where the pig (or sphere) is cleaned with and as part of the pipeline. However, the Premisphere system is not suited to all applications – in fact, no single system can ever suit all jobs. For this reason, we also supply and support alternative pigging and product recovery systems from two other world-class manufacturers who also specialise in Hygienic pigging and product recovery systems. The combination of 3 very different systems, each having its own features, allows us to provide a product recovery system that is tailored to your process. We provide independent advice and un-biased technical support at the all-important enquiry stage for your project and we don’t stop there! We will be on site for commissioning and always available for advice and after-sales backup for the life of your investment.